one of the best things about being a Beauty Blogger? getting information like this in my inbox. pink manicures and cellphones? good. if you are a local Denverite i would recommend heading to Park Meadows this Thursday for a chance to get a manicure designed by celebrity manicurist Kandi Banks. Kandi has put together exclusive nail art designs that are only available at the Lumia Lounge. plus, there will also be experts there to give fashion and beauty advice, the same experts who style Nicki Minaj, Drake and Janelle Monae. last, this isn't any regular manicure. 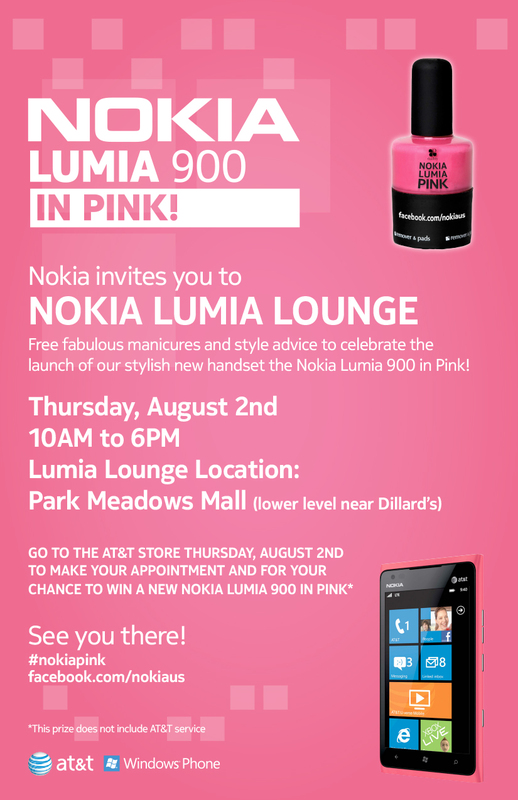 this manicure will include the limited edition Nokia Lumia Pink nail polish created by Duality Cosmetics, available exclusively in the Lumia Lounge only. i have already schedule my appointment and will be getting my nails did, along with a few girlfriends. hope to see you there.